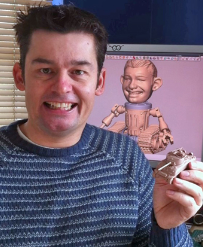 This morning it was announced that James Mason, a product designer in the UK, was the winner of Develop3D Magazine's Make A Bot competition. First among hundreds of entries, James used Geomagic Freeform from 3D Systems to create a robot design that incorporated 3D sculpting, 3D scanning, old parts from the real world, and 3D design. His own head, sculpted as a caricature by Simon Goodall, tops off the design with a bobble-head action. Here's a bit about the design in James' own words after a quick email Q&A. Can you describe the design? The Design evokes a bit of fun and repurposing existing objects. To look at things you may have lying around, like old parts remaining from broken old toys and then morph and modify them into something new, also giving a nod to a certain modern day animated film. What inspired you to come up with this particular design? First thoughts of being free to design a robot lead me of think of all types of"cool-looking" Transformers and Ironman type super heroes. Quickly reeling myself back I chose to make up a brief around the amazing state of the CAD/CAM technology Industry today. Coupled with a big sense of fun and being mindful of the typical user of this prosumer technology. I put myself in the position of the youngsters and freeing up the possibilities of creating something more personal with the kids along the lines of our very own toy figure. The result? 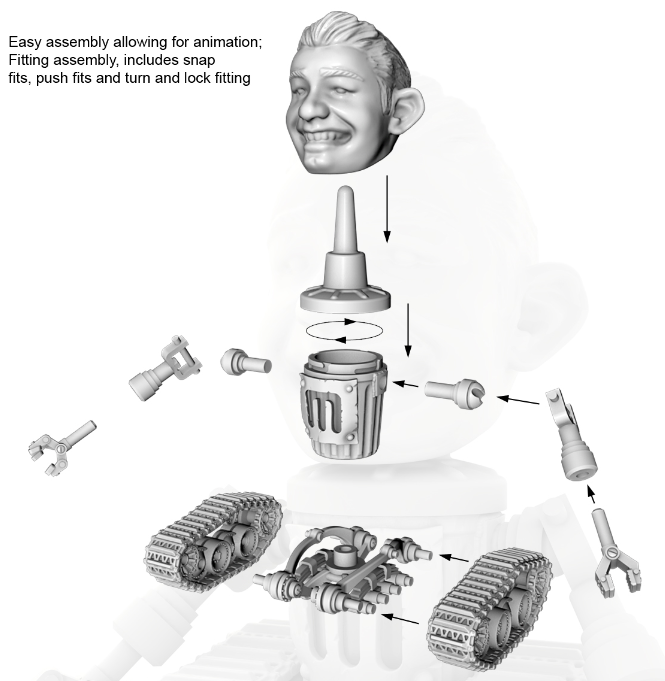 Our own animating self-assembly robot kit figure based on the ubiquitous Bobble Head dolls of the 70's. Whose face is that on the robot? The face is a caricature of yours truly, this was hand sculpted by an artist friend of mine, Simon Goodall. Well I say hand sculpted, it was using the Phantom Haptic device and the FreeForm Modeling system. Using FreeForm, Simon is able to make a real-time impression of me in a very brief sitting of just 15 minutes, utilizing his natural sculpting talents in a digital format. Working in Freeform, what were the particular challenges you had to overcome to make this design? Working in FreeForm allowed me access to engineering functions within an organic shape, for example I needed to know exactly where the center of gravity was for the head shape. Then create an accurate recess in the underside of the Head that would be in a precise position above that center of gravity location in order for the head to balance and"wobble" just like a bobble head should. FreeForm is also the only CAD tool I know of that can have all data types in one single modeling environment and work with least effort. Hence making this process in itself a true Hybrid, reflecting the design. See the announcement in Develop3D magazine.